Archaeopteryx lithographica (ahr-kee-OP-ter-ix) meaning "ancient wing", because it resembled an ancient bird (Greek archaio = ancient + pteryx = wing), refers to a Jurassic fossil with both bird and dinosaur features, and is widely accepted as the earliest and most primitive known bird. The discovery of the first intact specimen in 1861, two years after Charles Darwin published The Origin of Species, set off a firestorm of debate about evolution and the role of transitional fossils that endures to this day. 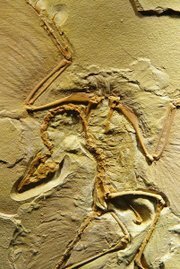 Over the years, ten specimens of Archaeopteryx have been found. "All ten fossils were found in a limestone deposit near Solnhofen, Germany." The fine-grained limestone, which preserves detailed casts of features not often fossilized, is used by artists and printers for lithographic plates, thus the species name lithographica. In the 1990s, the discovery of a number of well-preserved feathered dinosaurs in China solidified the link between dinosaurs and birds. 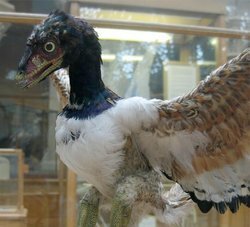 Archaeopteryx was similar in size and shape to a magpie, with short, broad wings and a long tail. The feathers resemble those of living birds, but Archaeopteryx was rather different from any bird we know of today: it had jaws lined with sharp teeth, three fingers ending in curving claws, and a long bony tail. Archaeopteryx is a powerful piece of evidence that birds evolved from dinosaurs. The skeleton is most similar to the dinosaurs of the families Dromaeosauridae and Troodontidae. However, it is not believed to be a direct ancestor of modern birds, instead an off-shoot which eventually became extinct without spawning any further species. Reports of an apparently earlier bird, Protoavis, are considered to be unproven by most paleontologists. There is some controversy about whether Archaeopteryx could genuinely fly, or only hop around and glide from trees. The lack of a large breastbone suggests it was not a strong flier, but flight muscles might have attached to the bird's thick, boomerang-shaped wishbone, a birdlike feature. The large wings and long tail, however, suggest that it was both stable and maneuverable in the air. The shape of the wings is similar to birds which fly through trees and brush. Prices current as of last update, 04/20/19 5:01pm.